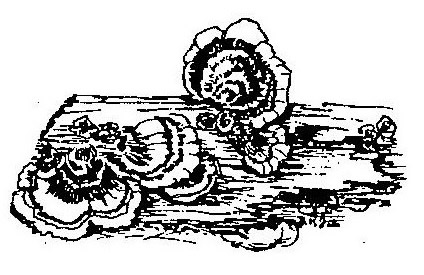 The basic process of making paper is straightforward and no different for mushrooms than for other fibers. The one significant difference is that you are using a chitin base rather than a cellulose base. There are several variations on the theme. These are very flexible guidelines. Optional: Iron, duct tape, binders, decorative strings, papers, plants, etc. *Although fleshy mushrooms can be used, you are more likely to have success with the tough, corky polypores and other fibrous fungi. Once collected, they should be soaked at least overnight and can be soaked for weeks if the water is changed every two or three days. 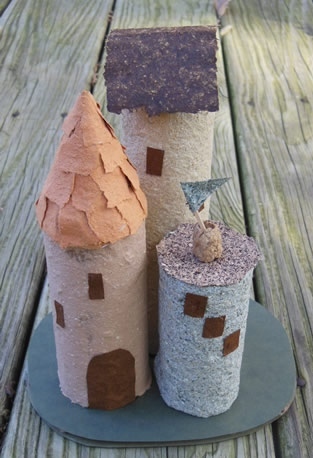 You may also wish to add recycled papers, colored strips or threads, scraps and such for binders and textures. If you use newspaper, you will always get gray overtones, which you may not wish. Most of the fungi will give you varying shade s of tan, from pale, almost white, to deep ecru, even to brown. They also have a very attractive aroma. You can buy a professional set or make your own. 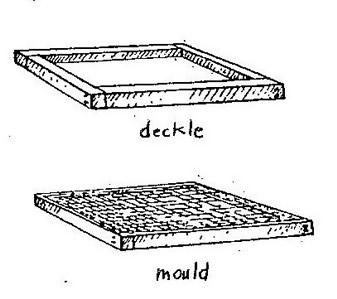 The deckle is a frame the same size as the mould. Both it and the mould can be made with wood strips shaped into a rectangle, like to 'L' shapes put together. The screen will be stapled or tacked to the top of the mould. The deckle is placed over the mould when picking up your fibers and it also 'edges' your paper. If you wish to simplify, you can dispense with the deckle and use screen wire with all four sides covered with duct tape to use as a mould. In this case, it is very important to hold it flat while lifting underneath the slurry. The edge may not be as even but that may be a desirable characteristic. Use your imagination... You may think of other frames, such as embroidery hoops with netting in them to serve this purpose. In any case do not begin with a large size. Make a thick stack of newspapers, over which place toweling or other absorbent materials. After soaking, chop the mushrooms and grind with water in blender for a minute or two. Blend on different settings until you get a puree. 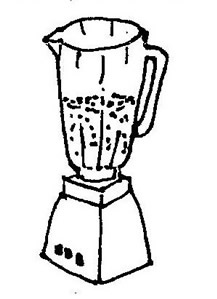 Do not overload the blender, repeat blend instead. If you wish to add bits of soaked paper or rags strips, add these at this time. Dump the stock into the tray with plenty of water. The amount of stock to water is something with which you will wish to experiment. Stir until materials are well distributed. With your hand, move from side to side under the surface of the water to more or less line up the fibers. Holding the 'deckle and mould' on each side, tilt it under the surface and quickly lift it up underneath the floating materials. Very quickly tilt it in each direction to get good coverage. If the screen is not well covered, dip it again until you are satisfied. Allow the paper to drip back into the tray until most of the water has run off. After you make a sheet of paper, you need to couch (pronounced “cooch”) it — or transfer it — to another surface. Place your hands so that thumbs are underneath, fingers on top of each side of the mold and quickly flip paper onto the sheeting or toweling. Screen should now be on top of your paper. With sponge, sop up excess water. Carefully lift the screen from your paper. If it has become too dry, the paper will tear or the screen will stick to it. If this happens, sponge on more water through the screen until you can get it to release. The thinner the paper, the more delicate this step becomes. Continue to dry by replacing newspapers and covering cloths. Ironing gently over a cover cloth can speed up this process. When dry enough to be easily handled, hang to complete or, if you wish very flat paper, put it under weights, continuing to change underneath papers or cloths frequently. There are no real mistakes. You can throw back whatever you do not like at any stage. The stock can be kept indefinitely; just add water. Do not flush down sink or lavatory as the stock and water may clog drains. Collect fresh or dried fungi. The woody polypores are the best... you do not have to add any other fibers or sizing. Break up the fungi into small bits (for the very tough fungi, this may be done after soaking or with a saw or both). Create a pulp from a handful of fungi bits and a cup of water in a blender. Check pulp for preferred consistency. Blend for more time if necessary. Place several batches of pulp into some water in a dishpan; stir slurry. Place a prepared mold and deckle under the slurry in an even motion. Lift up and give pulp on screen a level small shake. Drain briefly at corners. Lift off the deckle and in one side-to-side motion, press the wet pulp onto a dampened sheet that is mounded on a folded damp towel on top of folded newspapers. Pulp should remain as a sheet of wet paper. Add another damp cloth and repeat process. Place wet sheets of cloth with attached paper in a plant press to squeeze out excess moisture. (You may iron briefly — always have a cover cloth.) Continue drying process by changing dry cloths in a plant press using newspaper to absorb water. When almost dry, peel off paper and place between clean dry cloths and dry newspapers. Press with heavy weight. Check daily and replace with dry cloths. 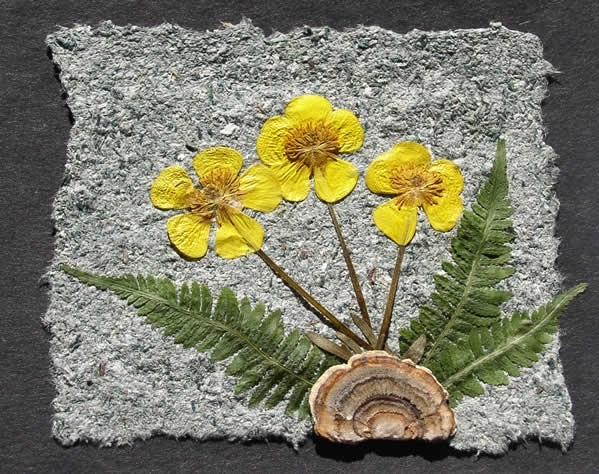 Once you've created paper from fleshy mushrooms and polypores, here are a number of suggestions how to use it. You can make greeting cards; paper sculpture; paper beads for jewelry; wall hangings; pictures in the collage style; and paper masks.